Immersed into the magic scenery of the Dolomites, La Ütia Apartment in La Villa, Alta Badia, welcomes mountain enthusiasts in a relaxing ambience with functional design and stunning views. This bright and spacious lodging (can host up to 9 guests) represents ideal accommodation in Alta Badia for large families and groups of friends. The location is crucial: panoramic, sunny and tranquil, on the edge of the forest that covers the approaches to the Gardenaccia massif, a part of Puez-Geisler Nature Park. Yet, the centre of La Villa and the ski slopes of Gardenaccia can be easily reached on foot in just a few minutes. Let alone hiking trails, cycling routes and MTB tracks that pass directly in front of the house. A cordial welcome is guaranteed by the Miribung family, who live in the same building and always remain at the guests’ disposal for information, advice, special requests and anything that could make your holiday in Alta Badia even more enjoyable. 90 square metres for a holiday full of great emotions, to be shared with all your loved ones, since La Ütia Apartment in La Villa, Alta Badia can accommodate from 6 to 9 guests and occupies the whole attic floor, equipped with an independent entrance. The interiors combine functionality of the classic design with characteristic details of the Alpine style. Among distinguishing features there are wood furniture and spruce ceilings with exposed beams. Large windows and two panoramic balconies, added during the recent enlargement, face some of the most picturesque spots in Alta Badia, such as Sasso di Santa Croce, Lavarella, Piz la Ila and the slopes of Gardenaccia, covered by coniferous woods. The apartment is composed of two double bedrooms and one triple bedroom. Besides, there is a separate living room with a double sofa-bed. The kitchen, also separate, is equipped with electric hob, fridge/freezer, dishwasher, toaster, drip coffee maker, electric kettle, cooking utensils, crockery and cutlery. 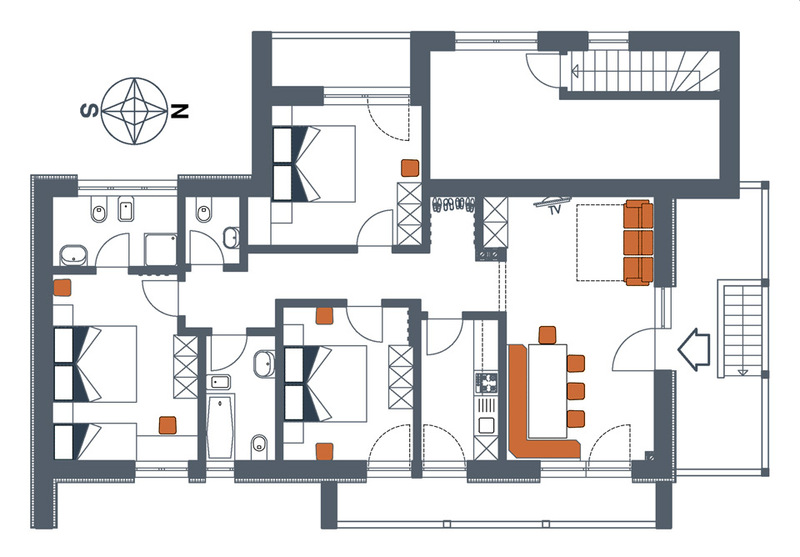 The apartments features a separate WC and two bathrooms with shower, WC, bidet and hairdryer. The other facilities include flat-screen TV, safe, WI-FI, bed linen and towels. The guests are also welcome to use the ample outdoor parking, the private ski/bike storage with a ski boot dryer and the outdoor terrace with a table and benches. Laundry service and fresh bread delivery for breakfast are also available upon request. During the low season the minimum stay is 3 days. During the main tourist season the apartments are rented only for the whole week, from Saturday till Saturday. All prices include: VAT, outdoor private parking, ski/bike storage with a ski boot dryer, bed linen, towels with midweek change, WI-FI connection, final cleaning. Extra services (fee-based): laundry service and fresh bread delivery in the morning. To the indicated prices will be added the local tourist tax of EUR 1.40 per person (over 14 years old) per day. Upon prior agreement, we accept small dogs, provided that their owners undertake entire responsibility for any damage caused by their pets. less than 3 days before arrival or no show: 100% of the total price will be charged. To settle the final bill you can use cash (up to EUR 3000), bank transfer and bank cheques. Credit and debit cards are not accepted. In case of payment by bank transfer o by bank cheque, we kindly ask you to provide payment upon arrival. In case of late arrival or early departure, the total price of the reservation will be billed. The apartment is available from 3 p.m. on the day of arrival until 9 a.m. on the day of departure. For lots of people Alta Badia is synonymous with Alpine skiing and snowboarding. No wonder – it is located in the very heart of Dolomiti Superski, a giant ski area that offers 1200 km of slopes, 500 km of which feature direct connections with Alta Badia. Yet, those who are fond of cross-country skiing, freeride, freestyle, ski mountaineering and snowshoeing will also be spoilt for choice. While families with children will fully enjoy winter playgrounds, toboggan runs, horse-drawn sleigh rides, various ski shows and a rich program of events. The summer holiday formula melts together pure air, unspoilt nature, mouth-watering cuisine and, of course, the magnificent Dolomites. The scenery of Alta Badia is a perfect background for outdoor activities: from trekking to high-altitude hiking, from road cycling to mountain biking, from free climbing and fixed-rope routes (via ferrata) to paragliding and hang-gliding. For families with children Alta Badia offers numerous themed trails, farms, lots of fun in Movimënt Parks and unmissable cultural and gastronomic events. The location of La Ütia Apartment in La Villa, Alta Badia, allows you to experience the Dolomites in all their diversity. Set at the margins of unspoilt nature, at the foot of the Gardenaccia massif and of Puez-Geisler Nature Park, the apartment is, at the same time, just few metres away from the historic and cultural centre of La Villa with its elegant parish church and imposing Colz Castle. Immersed in a dense network of hiking paths and cycling routes, La Ütia Apartment in La Villa turns to be great accommodation for sports enthusiasts: the ski slopes of Alta Badia and the MTB downhill tracks of the Gardenaccia freeride area are just 150 m away, the starting line of the world-famous Maratona dles Dolomites is 1 km away and a glance out of the windows immediately identifies the legendary Gran Risa slope, that hosts the key event of every winter season – the Men’s Giant Slalom race of FIS Ski World Cup.